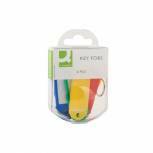 Q-Connect Key Fobs Assorted (Pack of 100) KF10869 Pack of 1 Q-Connect Key Hangers. Key hangers with write on label and coloured plastic surround. Suitable for use with the Q-Connect key cabinets (KF02605, KF04027, KF04274). Assorted colours. Q-Connect Sliding Key Fob Assorted (Pack of 40) KF10878 Pack of 1 Q-Connect Key Fobs. Key fobs with write on label and coloured sliding covers. Suitable for use with the Q-Connect key cabinets (KF02605, KF04027, KF04274). Assorted colours. 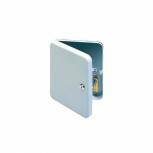 Q-Connect 20-Key Cabinet Pearl Grey KF02605 Pack of 1 Wall mounted storage cabinet for the safe-keeping of up to 20 keys. 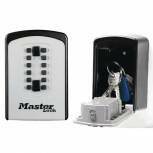 Includes assorted pack of key hangers, wall fixing kit and labelling strips Complete with cylinder lock and two keys. Dimensions: 20 x 16 x 6cm. 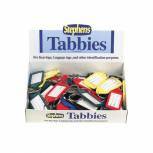 Stephens Assorted Tabbies Keyrings (Pack of 10) RS046257 Pack of 1 Tabbies key rings with label. Plastic protects your note from damage. Ideal for labelling keys. Labels can be switched. Assorted colours. Ring Diameter: 30mm. Pack size: 10. 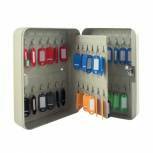 Helix Standard Key Cabinet 30 Key Capacity 520310 Pack of 1 All steel constructed secure key cabinet with a cylinder lock indexing labels and assorted colour key fobs. 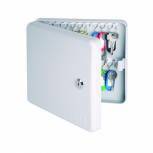 All units are supplied with a wall mounting kit and instructions. 2 keys and the Helix extra spare key service. Key Capacity - 30. Colour - Grey. 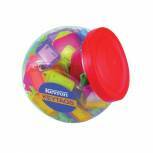 Kevron Plastic Clicktag Key Tag Assorted (Pack of 100) ID5AC100 Pack of 1 Kevron plastic clicktags with 35x22mm insert card. Cover clicks to secure insert. 19mm stainless steel key ring. Assorted. 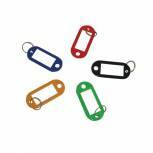 Helix Assorted Sliding Key Fobs Medium (Pack of 50) F34020 Pack of 1 Helix Medium Sliding Key Fobs. Easy to use key rings with coloured tags, White card inserts and protective covers - ideal for key and luggage identification purposes. Assorted Colours. 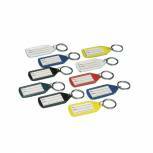 Helix Assorted Sliding Key Fobs Large (Pack of 50) F35020 Pack of 1 Helix Large Sliding Key Fobs. Easy to use key rings with coloured tags, White card inserts and protective covers - ideal for key and luggage identification purposes. Assorted Colours. 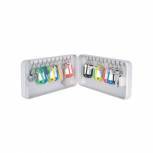 Helix Standard Key Cabinet 20 Key Capacity 520210 Pack of 1 All steel constructed secure key cabinet with a cylinder lock indexing labels and assorted colour key fobs. 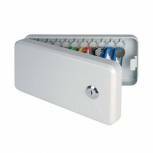 All units are supplied with a wall mounting kit and instructions. 2 keys and the Helix extra spare key service. Key Capacity - 20. Colour - Grey. 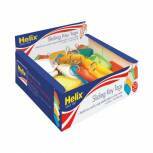 Helix Standard Key Cabinet 10 Key Capacity 520110 Pack of 1 Helix Standard Key safe Cabinet. All steel construction with a durable gloss finish. Metal key hanger strips and index sheet. Cylinder lock with 2 keys. Supplied complete with wall fixing kit. Capacity - up to10 Keys. Colour - Grey. 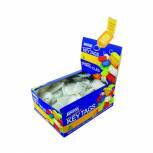 Kevron Plastic Clicktag Key Tag Large Assorted Tub (Pack of 70) ID30AC70 Pack of 1 Stainless steel rings and plastic construction keeps tags pristine. Large tag for more information. Range of assorted colours. Click design for easy use. Tub of 70. Tag Size: 74x38mm. Insert Size: 50x31mm. 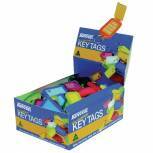 Stephens Assorted Tabbies Keyrings Display (Pack of 50) RS521211 Pack of 1 Tabbies key rings with label. Plastic protects your note from damage. Ideal for labelling keys. Labels can be switched. Assorted colours. Ring Diameter: 30mm. Pack size: 50. Kevron Plastic Clicktag Key Tag Large Assorted (Pack of 25) ID30AC25 Pack of 1 A larger key tag with 50x35mm insert card. Assorted colours - Red, Blue, Green, Yellow, Orange and clear. 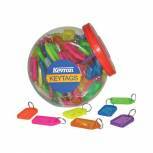 Kevron Plastic Clicktag Key Tag Large Assorted Tub (Pack of 150) ID5AC150 Pack of 1 Assorted coloured key rings with click tabs to keep keys secure. Tabs can be written on for easy identification. Ideal for schools, offices etc. Securikey Push Access Key Store Black /Grey 5412D Pack of 1 Securikey Select Access Key Store 5412D. Push button key store with up to 4000 possible codes. Large enough to accommodate bunches of keys. Solid zinc weather resistant body resists hammering or sawing. Ideal for commercial and domestic use. Durable Badge Reel Keyring Charcoal (Pack of 10) 8222/58 Pack of 1 Badge reel with key ring fastener. With a 85 cm retractable cord, this badge reel is suitable for holding keys or security cards. Features a crocodile clip fastening on the reverse. Ring diameter 25mm. Q-Connect Key Fobs Assorted (Pack of 6) Pack of 10 Q-Connect Key Fobs. Split ring key rings with a coloured label holder. 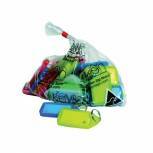 Supplied in handy packs of 6 assorted colours. Q-Connect 48-Key Cabinet Pearl Grey KF04027 Pack of 1 Q-Connect key cabinet. Includes assorted pack of key hangers, wall fixing kit, labelling strips and index sheets. Complete with cylinder lock and two keys. Capacity: 48 keys. Dimensions: 25 x 18 x 8cm. Helix Standard Key Cabinet 100 Key Capacity 521110 Pack of 1 All steel constructed secure key cabinet with a cylinder lock. 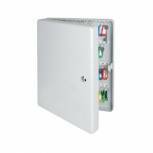 All units are supplied with a wall mounting kit. Key Capacity - 100. Colour - Grey. 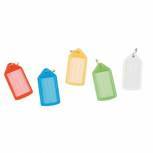 Kevron Plastic Clicktag Key Tag Clear (Pack of 100) ID5CLR100 Pack of 1 Kevron plastic clicktags with 35x22mm insert card. Cover clicks to secure insert. 19mm stainless steel key ring. Clear.